It is important to understand the layout of a room and its usage before selecting the right type of flooring for that space. In most cases, homeowners use tile floors for kitchens and bathrooms. Tiles have many types of stone, ranging from marble to travertine to slate, but they generally fall under ceramic or porcelain categories. After purchasing the tiles for a room, the next step to take is installing the tiles. This info page from Bassett Carpets will seek to provide guidance for the installation process! For the planning phase, you must learn about the material of which the existing floor is made. Plywood makes this process easier, but you may have to remove the base trim and the particleboard instead. This step will help when replacing the particleboard with plywood. One necessary tool that for this process is the Skil saw. After replacing the particleboard, inspect the space, so it is attached to the floor joists. By this stage, the floor is ready for the leveling compound. You will need backer board made of fiberglass or cement, sized at 3 by 5 feet. This is to ensure the tile does not pop off. At this point, you should have measured the room size and distance of opposing walls. These measurements let you know the number of tiles you need to buy. If you have not done so already, you should also determine the tile sizes and patterns. Be sure to have 15% more tile than the square footage measured, since many of the tiles become cutoffs. The last step in planning is making sure that the entire surface is smooth. Use a floor-leveling compound to float out any divots, holes, or differences in subflooring height. You will have to pick up the rehearsed tiles and set them aside, so you can begin spreading the adhesive. Using a notched trowel, start from the center point and apply to small sections at a time and follow the rehearsed pattern. Spread the adhesive evenly in a raking motion. Set the first tile in place with the corner lines made by the center point, without any additional pressure or twisting motion. Set the tile spacer and continue this process with the remaining tiles. After the tiles have been set, wait at least one day or overnight, so the adhesive has plenty of time to dry. Once the adhesive is cured, you can grout the joints! In some cases, you may need to drill holes in the tiles for items such as radiator pipes or bath pipes. Once you’ve rehearsed all the tile placements and finalized measurements, you are ready to lay the adhesive. 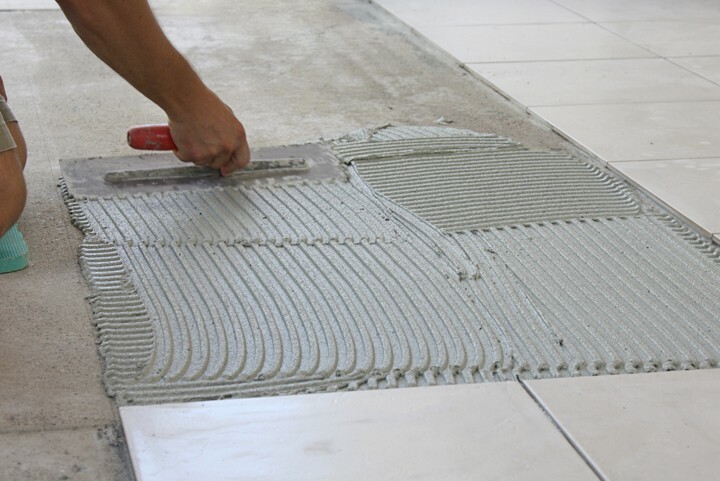 Using a rubber float, press grout into the joints to an even level at a diagonal direction. Skim the excess from the tile with the rubber float. Wait a few minutes for the grout to stiffen up in the joints. To work across the joints, use a damp sponge to remove haze and any residue from the tiles. Continue this process for all joints in the remaining quadrants of tiles. It is best to use caulk for joints at the wall and floor interfaces, since tiles can expand or contract depending on temperature. The caulk will help buffer the expansion and contractions that happen over time. After grouting, let the whole flooring area cure for about a week before mopping it to remove remaining haze. And that’s all it takes! If you still have questions, be sure to call/email the Bassett Carpets team or contact your local contractor to aid you throughout the process.